Pennsylvania has found a sensible workaround to the ideological divide over funding private schools with public money, said Zachary Navit (2L), as he presented the semester’s second Student Scholars Series lecture on March 26. Two state programs bypass the issue by providing tax credits to businesses for funds donated to approved scholarship or educational improvement organizations which benefit eligible students in both public and private schools in the Commonwealth. Since these tax credit programs are not government funding of institutions but private money going to private foundations, the system avoids constitutional attacks. Other states could learn from Pennsylvania’s approach, Navit argued. 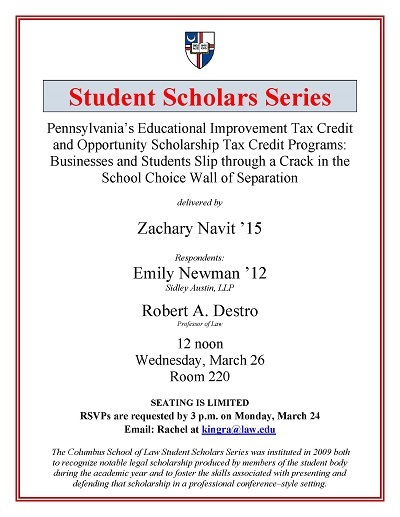 Navit, Zachary, "Pennsylvania’s Educational Improvement Tax Credit and Opportunity Scholarship Tax Credit Programs" (2014). Student Scholar Series. 22.